In effort to more clearly and accurately portray our terms and policies we have updated the wording in our Terms sections which includes information on Care of Your New Collar, Returns and Exchanges, and Processing and Shipping information. We have also included new sections on Photography and Privacy. These polices are found on our website under the Terms tab. For retailers please view the Wholesale Pet Supplies section on our website for updated wording on wholesale policies. Thank you for your attention to these policies as we try to better serve you. As always, happy days and wagging tails to all! We do not size like other manufacturers. Do not use the size off of any other collar to choose your size for our collars. Our measurements are based off of actual snug neck sizes in inches. Please be sure to view our Sizing Chart Tab at the top of our website page for instructions on measuring and use our Sizing Chart to choose the correct size for your pet. Your item is actually made by hand after we receive your order. Orders placed by 5 pm CST are processed the following day. Orders placed after 5 pm CST roll over to the next processing day. Allow 1-3 business days for us to hand make your order. For larger orders, please allow 2 weeks to make them. Allow another 3 to 5 business days shipping time for your order to arrive at your location in the USA with longer shipping time for international orders (7-21 business days). If you need to rush your production time you have the option to rush your order. The Rush Order option expedites the production process, reducing the number days we take to print and get your order ready for shipment. Rush orders are ready for shipment in 2, and sometimes 1, business days! We wish we could do it even faster, but remember they are custom, hand crafted collars so they take time to make! We do our best to ensure we accurately portray the product to you. Every reasonable effort has been made to accurately reflect actual colors however due to variances between monitors, colors cannot be guaranteed. On occasions, there may be minor differences between the product’s appearance in the photograph and the item delivered. Every month, we’ll choose one (or more) of our fabulous customers to put in film and serve as our Hollywood Pet of the month. We’ll feature them on our Facebook page, on our Twitter, and they’ll be placed in the gallery on our website! Want your fur baby to be a Hollywood Pet? 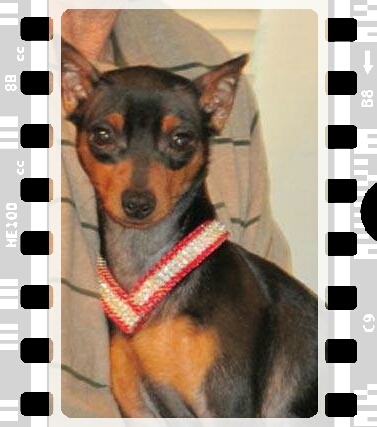 Send us a picture of them sparkling in their collar from Rhinestone Dog Collars! Our Hollywood Pet for the month of September is the beautiful Bella! 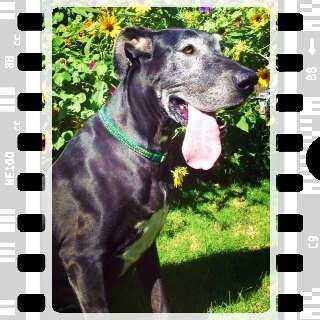 Bella is a 7 year old Great Dane who lives in Southern Utah. Great Danes are said to be large and noble and are often referred to as gentle giants. Bella looks sweet and gentle, and very noble in her sparkling green collar! Her human loves the Angel in Emeralds collar and says, ” I can’t stop looking at it!” We can’t stop looking at Bella! Welcome to Hollywood Pets! While we’ve already introduced you to our friend Lott-E, we also want to be sure she’s recognized as a Hollywood Pet! We introduced Lott-E on our Facebook page earlier this month before Hollywood Pets was an official project. Without further ado, here she is again! 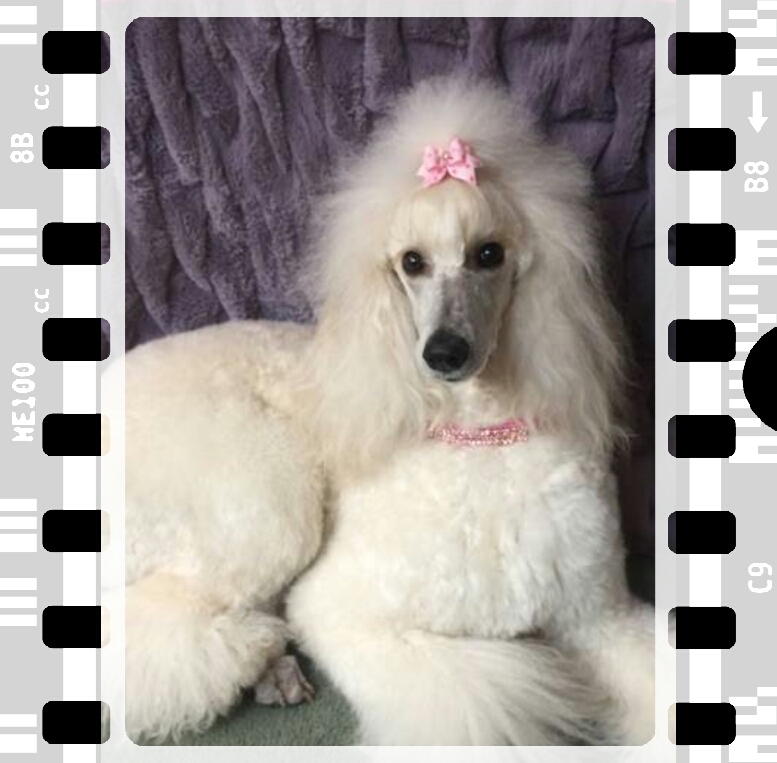 Lott-E is a standard Poodle who shines in her sparkling collars! Our Lil Bit O Velvet Sparkle gives you lots of room to design your own collar! These 3/8″ plush velvet collars have always came in your choice of colors – you’ve been able to pick everything from velvet color to stone color! Now, we’ve made it even easier to let us know what you want! 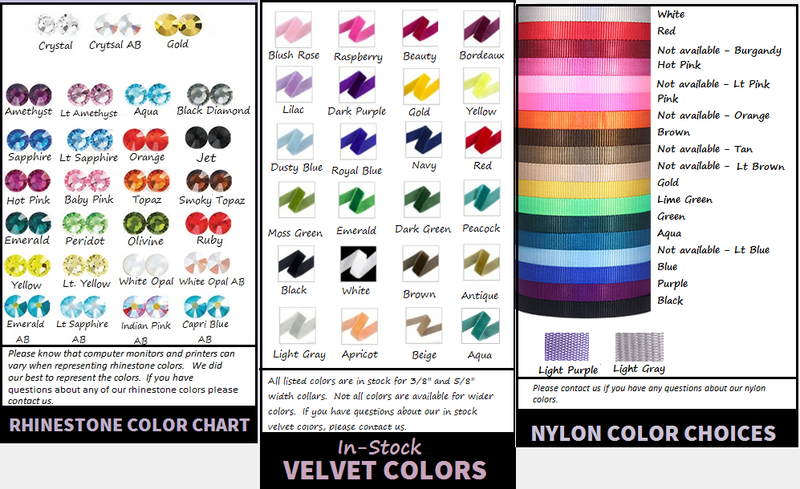 We’re happy to bring you our rhinestone, velvet, and nylon color charts! 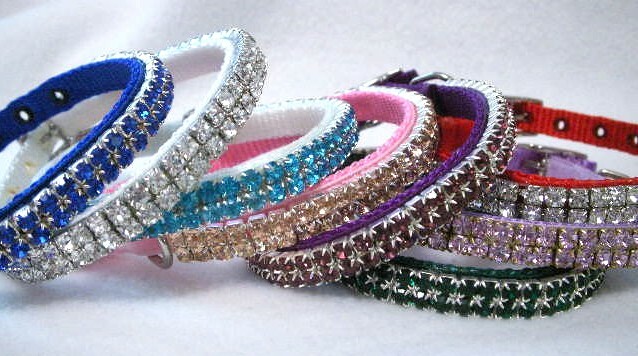 Rhinestone Dog Collars Does Custom Collars! Like the style of a certain collar but want it done in different colors? We do custom collars! Want something you’re not seeing on our site? Use the Contact Us tab at the top of the website page to send us an email about what you want. We’ll work with you to build a collar that will perfectly suit your fur baby!